The next woman said it was usually nothing but we’ll do the standard blood tests and xray. The next man, an hour’s drive away, said we’re going to operate. Now. They said to sing to my limp six month-old baby as she fell off the precipice of consciousness and into emergency surgery. The next man said we’ve cleaned her up, and now she’ll have medicine in her jugular for a month. At later bad news he did suggest a tear in my presence. “I’m sorry I couldn’t hide my worry…” I said I wouldn’t get through this with a doctor who didn’t show he cares. We were "part of the furniture" they said, we were there that long. Women and men crowded around us like a pair of arms, carrying us, caring for us, showing us love while we were isolated from those who loved us. 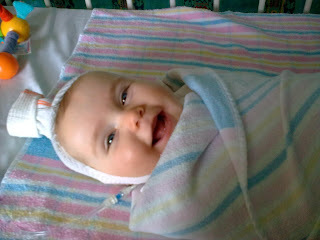 My baby floated upon their compassion, up and down, through needles, tubes, oxygen and isolation. They dragged me when I stopped, heavy on the outskirts of their responsibility, crying, sleepless, insane and unsure. ‘Nurse’ and ‘doctor’ are silly words. These people have God in them. They save lives. They saved mine: Our baby survived. They do a marvellous job too. I'll give them a shout out too , now I know about gold coin week.